The post below on Caffe Falai is no longer valid. Caffe Falai closed in late 2013 /early 2014. Yes, you read that right! My friends and I were served the blueberry tart on the house by Caffe Falai. Granted we were waiting for 20 minutes for a table despite showing up on time for our reservation, but hey, this is New York, and there are many establishments here that would make you wait at the bar for 20 min (because “the table is being set-up which will only take a few moments”) and you order pricey and often exotic cocktails while you are waiting. The folks at Caffe Falai did not have to be so nice, but they were! This was our first, much anticipated visit to Caffe Falai and it exceeded expectations not merely because of the free dessert. But here is a warning – while this restaurant offers a range of vegetarian options, the dishes are not necessarily low calorie despite relatively small portions. 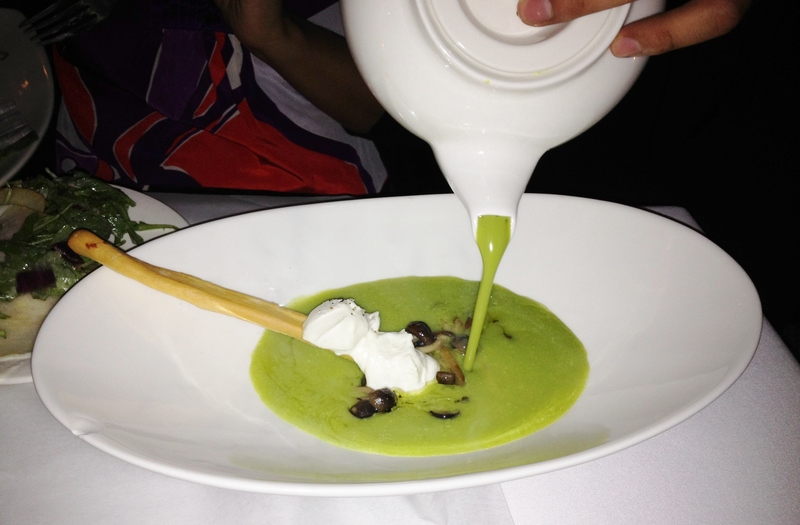 The Cauliflower and potato cream soup was very refreshing with the cream and the black truffles. You can see it being poured into the dish in the photo gallery above. 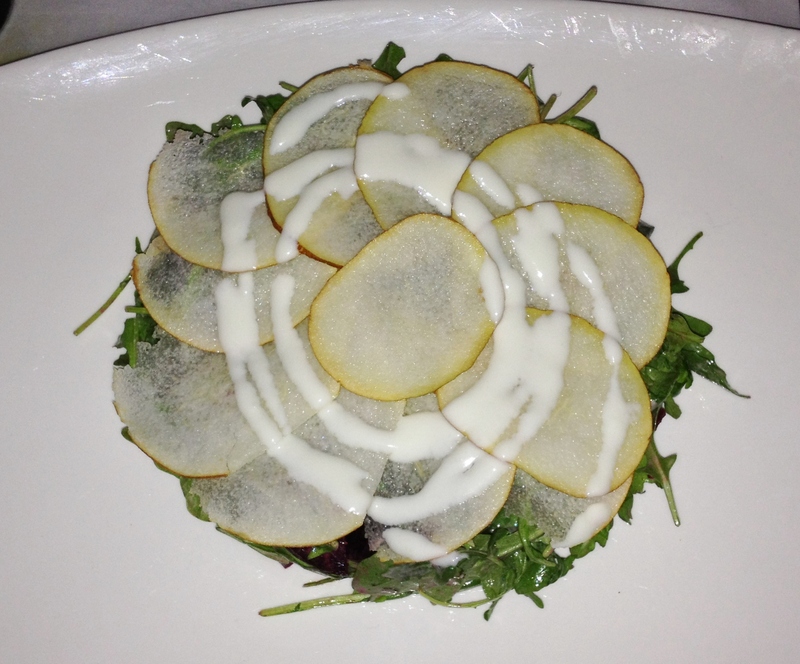 The arugula and pear salad was light, and could have had more candied walnuts. The pear slices and the candied walnuts were balanced by the mustard dressing. 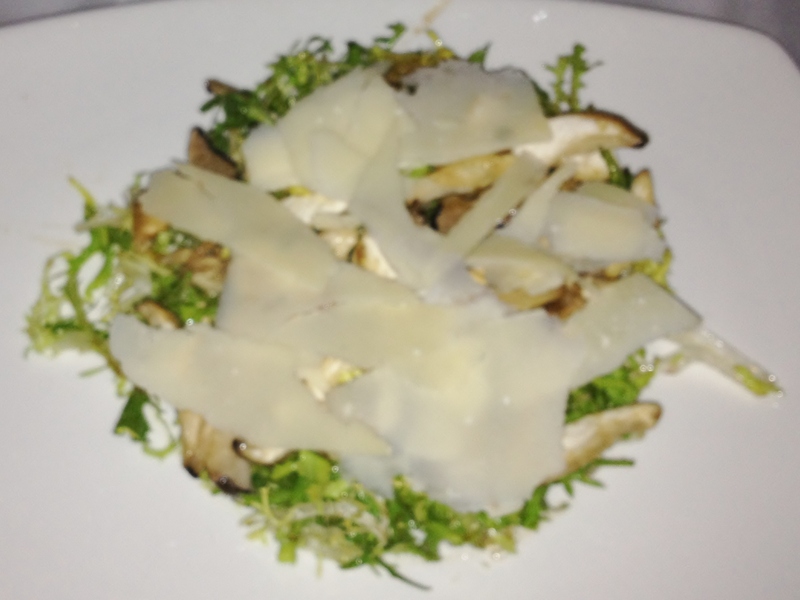 The fungi salad with the frisee was among the best frisee salads that I have ever had. Frisee usually has a distinct slightly bitter taste, but the chestnut honey and the shaved parmigiano in the salad more than took away the focus from the frisee. I thought the mushrooms were slightly raw, but overall went very well with the rest of the ingredients. The octopus dish is an antipasti which I had for my main course. To say that it was a disappointment is being very kind to the dish. 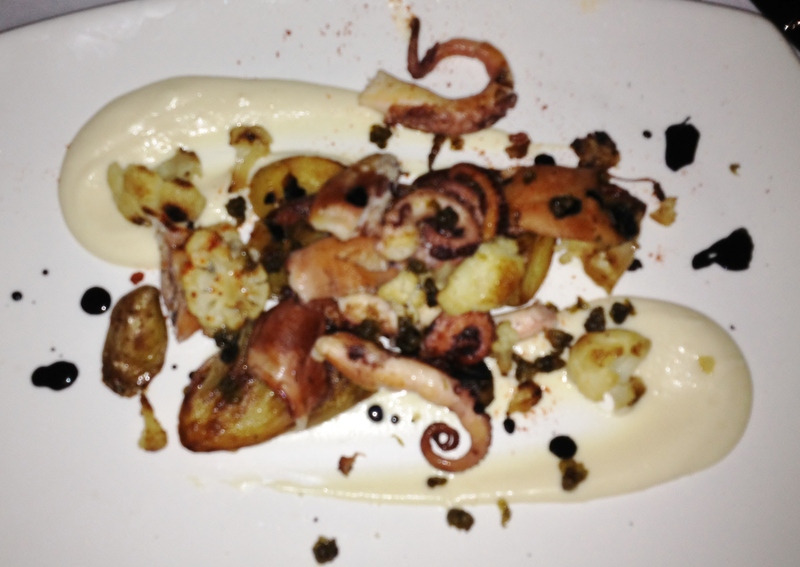 The octopus was extremely dry and chewy, the fried capers had no flavor, the smoked paprika might as well have been absent, and the fingerling potatoes were dry and inadequately salted. The black squid ink added some color to the dish. I assume that the coloring and the neat pattern it made on the plate were the sole reasons for its addition to the dish. You already know that the blueberry tart with vanilla cream was served on the house. 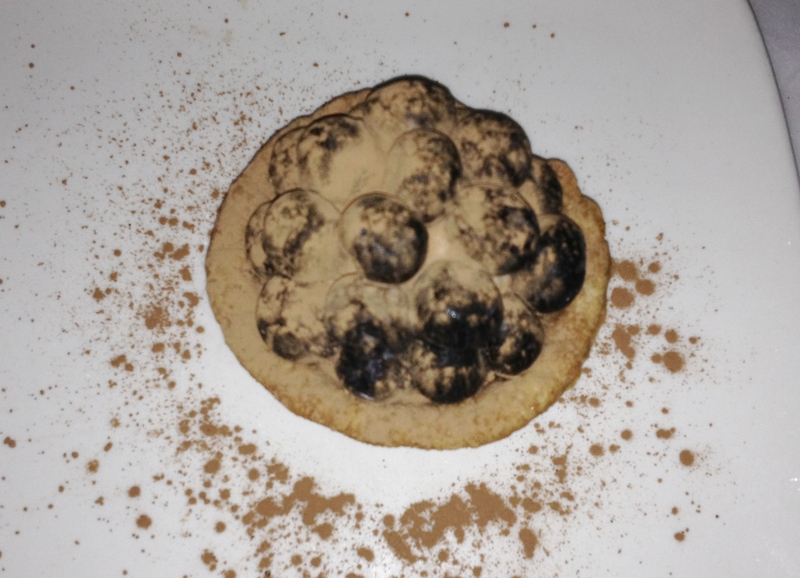 The cool vanilla cream and the blueberries were just perfect and were dusted with chocolate powder. The crust could have been slightly more flaky, it seemed too dense in texture, but was fine to taste. Alas! We had no space left in our tummies to try out any other dessert. The milk (for the tea) was in a tiny serving bowl that served as the lid for the tea pot – very cute! Is there a signature dish at Caffe Falai? Yes, there is!! 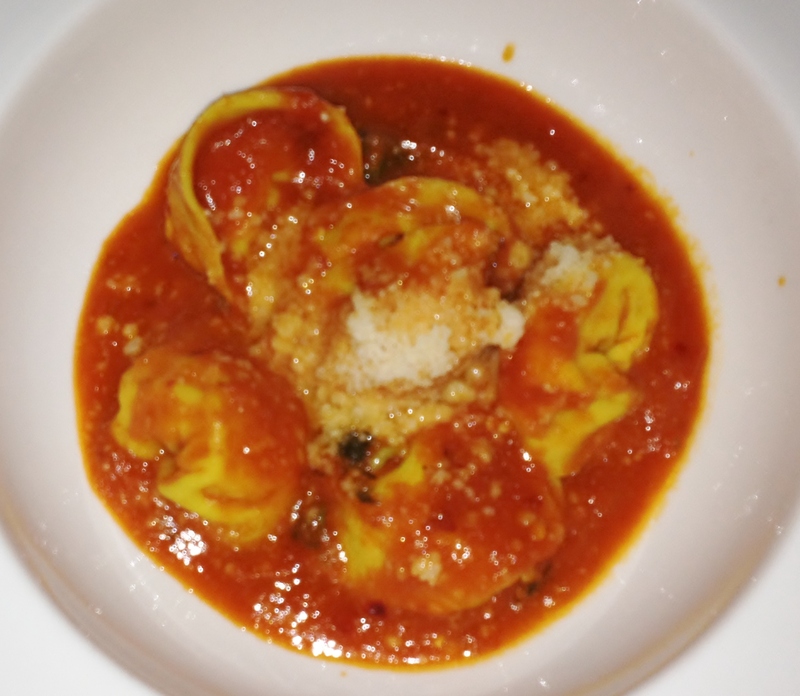 Its the Gnudi – the spinach ricotta dumplings with brown sage butter and parmigiano. 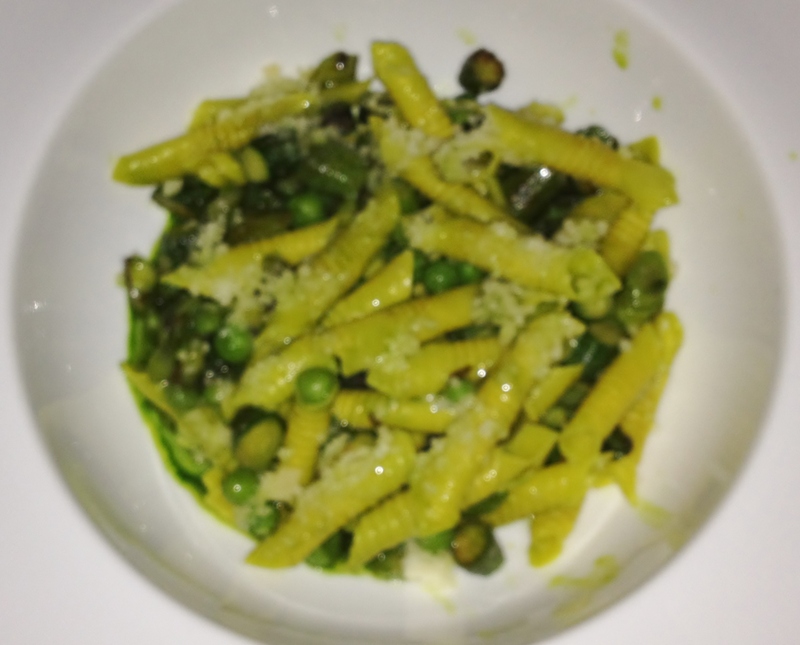 We ordered it even though we did not know that its the signature dish of the chef – Iacopo Falai. 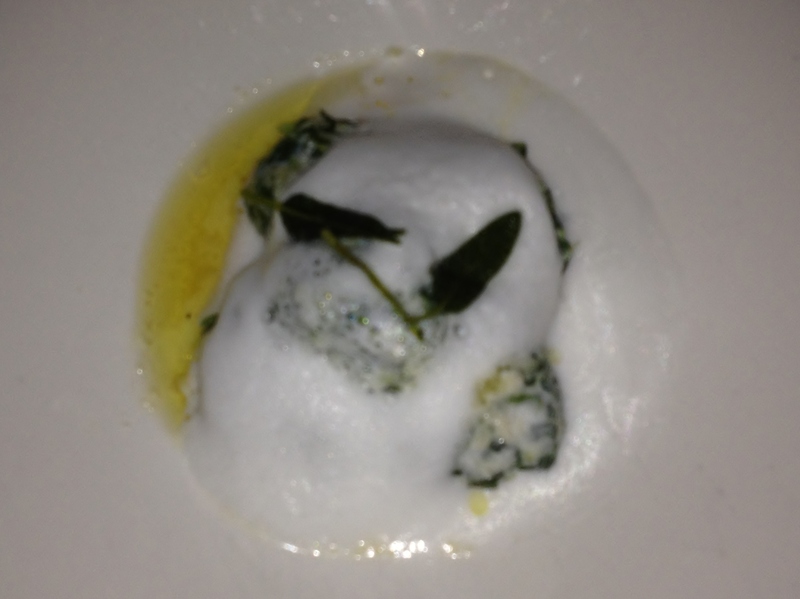 The spinach ricotta dumplings were not too “green” with just the right amount of ricotta. The brown sage butter foam circling the dumplings and the parmigiano enhanced the flavor of the dumplings and raised the calories of the dish as well. Certainly worth trying if you visit Caffe Falai. What else would we have had at Falai? or What would we have if we were to go back? Flourless chocolate cake – need I say more? Caffe Falai’s neighbor in Soho is Bottega Falai. The Bottega (opened in April 2011) apparently stocks grocery items (pasta, spices, oil etc.) imported from Italy as well as take-away foods. Bottega Falai was closed when we went to Caffe Falai for dinner. Eater NY reported in 2011 that a couple of other sister concerns of Caffe Falai – namely Falai and Falai Panatteria were closed in 2011. Inspiration to return! Haven’t been in ages but loved it at the time. Thank you! That food looks great and sounds delicious!